At the left end of the spectrum, activities are fundamentally about bolstering human development. These activities focus on reducing poverty and addressing other fundamental shortages of capability that make people vulnerable to harm, regardless of whether the stressors that can lead to harm are related to climate change. Example activities include livelihood diversification efforts, literacy promotion, women’s rights initiatives, and even projects that address HIV/AIDS. In this zone of the continuum, adaptation focuses on building robust systems for problem solving. These capacity-building efforts lay the foundation for more targeted actions and frequently entail institution-building and technological approaches familiar to the development community. Examples include the development of communications systems and planning processes, and the improvement of mapping, weather monitoring, and natural resource management practices. When adaptation efforts focus more specifically on hazards and impacts, an important framework for action is provided by the concept of climate risk management (CRM). CRM refers to the process of incorporating climate information into decisions to reduce negative changes to resources and livelihoods. This framework accommodates the fact that often the effects of anthropogenic climate change are not easily distinguished from the effects of events and trends within the historic range of climate variability. The CRM approach encourages managing current climate-related risks as a basis for managing more complex, longer-term risks associated with climate change. 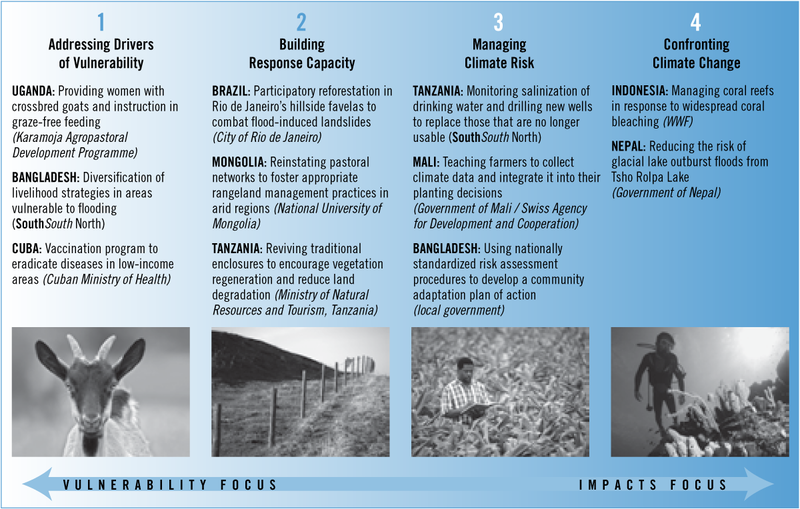 For a small set of examples of adaptation in our review, actions taken focus almost exclusively on addressing impacts associated with climate change. Typically, these actions target climate risks that are clearly outside of historic climate variability, and have little bearing on risks that stem from anything other than anthropogenic climate change. For example, communities that relocate in response to sea level rise mainly fall into this category, as do many responses to glacial melting. Radical or costly policy and technological approaches that address unprecedented levels of climate risk also belong in the highly targeted category. Few of these approaches have been seen to date, but efforts in the Himalayas to prevent harms from glacial melting, and Australia’s overhaul of water allocation rules after six years of drought probably are signs of things to come.